Global stocks are diving in what has been a generally quiet session, amid renewed trade war fears following reports that the Treasury Department is planning to heighten scrutiny of Chinese investments in sensitive U.S. industries under an emergency law, putting Washington’s trade war with Beijing on what Bloomberg dubbed a "potentially irreversible course", while at the same time Trump threatened "more than reciprocity" to trade barriers. According to overnight news reports, the US Treasury is devising rules to block firms with 25% Chinese ownership from acquiring companies involved in industrially significant technologies and that it plans using International Emergency Economic Powers Act 1977 to impose investment restrictions. "This one could well result in an escalating trade war,” Lee Ferridge, a macro strategist at State Street Corp., told Bloomberg TV in Hong Kong. “Volatility is going to continue to rise from here." Adding to the trade war jitters, an EU internal memo says trade crisis "set to deepen in coming months" and warns of the breakdown of rules-based trading. The EU Commission has also warned of a direct response to any new taxes on EU cars imported into the US. 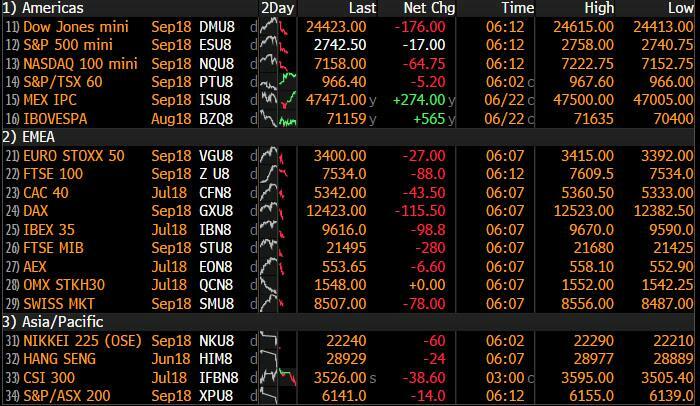 The result has been a sea of red with European equities following Asia lower from the open, with the mining and auto sectors underperforming, resulting in a sea of red across global stock markets. Europe's Stoxx 600 Index declined as every industry sector fell. Earlier, equities in Shanghai and Hong Kong led a retreat in Asia in the wake of various reports the Trump administration is preparing new curbs on Chinese investments. Nasdaq and S&P futures are also near session lows, while the 10Y Tsy has been bid, its yield sliding as low as 2.865%. 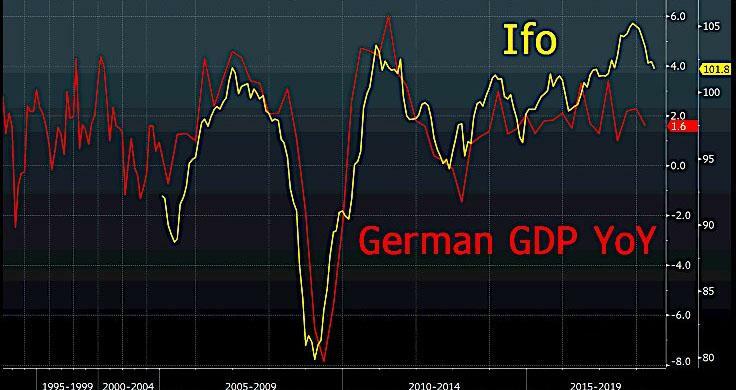 As Holger Zschaepitz notes, Germany's Ifo business climate at 101.8 still at elevated levels, and points to GDP YoY growth of 2%. Italian concerns added to the volatile mix, with bonds slumping after the League party continued its post-election bounce in a second round of municipal voting coupled with an EU emergency meeting on refugees which suggested that Italy now has the upper hand over Germany, putting Merkel's political future in doubt. As Italian bonds slumped, yields on the 2Y BTP have blown out on Monday, rising back over 1%. European banks followed suit with the Stoxx 600 Banks Index dropping 1.4%, the worst performing group in the broader market, led by Commerzbank and Italian banks. China’s shares and currency fell after Sunday's announcement the PBOC would cut China's Required Reserve Ratio, freeing up more than $100 billion in the banking system to help cushion a slowing economy, a move that was anticipated, and which however has been seen as insufficient to offset the potential economic slowdown that may be inflicted on China as Trump escalates protectionist measures. Chinese Property developer shares were among the worst performers in Hong Kong, as China’s planned reserve requirement cut isn’t seen boosting housing market, but rather channel funding to debt-equity swaps and SMEs; unlikely to benefit developers or homebuyers looking for mortgages. Hang Seng Property Index drops as much as 1.5% to two-month low. Following the RRR cut, the onshore Yuan dropped to its lowest since early January while the offshore CNH tumbled to levels last seen in 2017, as the Shanghai composite failed to rebound on China's easing and dropped more than 1%. Despite the latest major liquidity injection, markets failed to respond positively because not only was the RRR cut telegraphed well in advance, it reflects officials’ concern over the economy, leverage and trade outlook. As Bloomberg reminds us, the move comes into effect one day before the first round of U.S. tariffs on Chinese goods begin, fueling trade tensions between the world’s two-largest economies, even as stress increases between the U.S. and its European trade partners. Elsewhere in Asia, the Singapore Straits Times Index fell as much as 1.1% Monday, poised to enter technical correction, as rising key interest rates and mounting trade concerns put regional economies under the spotlight and affect the outlook of a key Asian trading hub. The 10Y Treasury climbed and emerging-market equities slid, in another sign of a risk-off impulse. Recep Tayyip Erdogan’s double victory in Turkey’s presidential and parliamentary elections triggered a lira rally, however, as we previewed the "optimism" was short lived, and the Turkish lira has since tumbled back to unchanged. 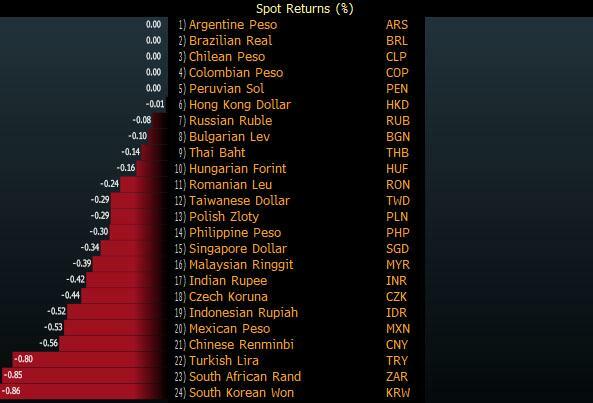 As we noted last night, and as sellside commentary published in the aftermath of Erdogan's re-election confirmed, while Turkey’s lira drew support from Erdogan’s victory, any gains will probably be short-lived amid concerns about the independence of the nation’s central bank and its monetary policy, according to investors and analysts. Not everyone agrees: Ark Capital, a Dubai- based hedge fund, which made money from the lira’s slump in recent months, is now seeking to profit from the currency’s advance after Erdogan’s election win. Elsewhere in FX, the dollar was range-bound, giving up some overnight gains, as London came into the market, although it has since seen a bid return and was trading near session highs; the yen gained against all Group- of-10 peers, while the euro stabilized in European morning hours, drawing some support from the trimming of long-dollar positions while Scandinavian currencies slid along with commodity currencies in reflection of the worsening risk sentiment. The big story, however, was once again in Emerging Markets which after enjoying a brief respite at the end of last week, have once again been hammered. In overnight central bank news, ECB's Vasiliauskas states the ECB could start to discuss lifting short-term interest rates from autumn 2019. Also overnight, the ECB's Praet (Dovish) said prolonging the purchase of assets for 2019 is an option. In the BoJ's Summary of Opinions from June 14th-15th meeting stated it is appropriate to pursue powerful monetary easing with persistence under the current guideline as inflation is a long way from target but added the momentum towards achieving 2% is maintained. Furthermore, Summary of Opinions stated that although Japan's GDP for the March quarter of 2018 contracted for the first time in nine quarters, this largely reflects temporary factors such as irregular weather. In the latest Brexit news, at least 50 UK Conservative MPs are willing to rebel against the government if PM May fails to inject more money into defence, an ally of Gavin Williamson, the defence secretary, said last night. The FT added that over 50 Conservative MPs are prepared to block any attempt to remove Britain from the EU without a deal — including some sitting ministers — according to senior Conservative politicians. UK Trade Secretary Fox told Sky he would accept an extended Brexit transition period given it was for technical reasons. Commodities trade mixed with WTI (+USD 0.21/bbl) now in the green, if below Friday’s highs after the conclusion of the latest OPEC+Russia summit in which member states vaguely agreed to boost production. Brent (-USD 1.01/bbl) on the other hand is lower as the global benchmark reacts to the OPEC and OPEC+ meetings at the back-end of last week. The oil producers agreed on an output hike, though no specific numbers were confirmed. The output increase is yet to be distributed amongst the members. Saudi Energy Minister Al-Falih said on Saturday that the increase is to be closer to 1mln BPD than to 600K BPD. The metal complex looks relatively mixed, gold and copper trades flat, synchronised with the uneventful dollar moves. Elsewhere, Shanghai steel rebar prices dropped for a second consecutive session following a rise in steel product inventories raising concerns about oversupply and weakening demand in the market. Looking at the day ahead, we get new home sales data and the Chicago Fed national activity index, while earnings are expected from Carnival. Asian equity markets began the week down as the region digested a targeted RRR reduction by the PBoC with reports the US is planning new restrictions on tech exports to China and on Chinese investment, which are expected to be announced by end of the week. ASX 200 (-0.2%) and Nikkei 225 (-0.8%) both initially opened higher with gains led by the energy sector in the wake of the OPEC+ agreement to raise output so they no longer overshoot on production cuts. The actual communique didn’t explicitly state an amount for the output increase, although the touted figures by ministers were much less than some of the previously suggested scenarios of as much as 1.8mln bpd, which in turn lifted crude by around 4% on Friday. However, gains in the bourses were later pared as trade tensions returned to the fore with the US Treasury said to be devising rules to restrict China investment under the International Emergency Economic Powers Act of 1977. Elsewhere, the Hang Seng (-1.2%) was among the laggards as money market rates in Hong Kong printed fresh decade highs, while Shanghai Comp. (-1.0%) was choppy as support from the PBoC’s policy efforts tussled with renewed trade concerns. Finally, 10yr JGBs were uneventful with prices flat near last week’s best levels amid the cautious risk tone. The release of the Summary of Opinions also failed to spur demand as the BoJ stuck to its rehashed statements, and the central bank’s presence in the market was largely ignored as it was only seeking Treasury discount bills. PBoC announced that it will lower some banks' RRR by 50 basis points on July 5th. European equities started the week with a bout of selling (Eurostoxx 50 -0.9%) as trade war woes dampen sentiment across the board. Overnight, it was stated that the Trump administration is reportedly planning to bar a number of Chinese companies from investing in US tech while blocking exports to China. The two measures are to be announced at the end of the week. In the wake of this, the IT sector in Europe underperforms. In terms of stock specifics, Prysmian (-7.3%) rests at the foot of the Stoxx 600 amid additional FY costs and a cut in the company’s EBITDA outlook. On the flip side, IWG (+3.1%) is on a firmer footing following confirmation that PE firm Terra Firma has approached the company about a possible bid. Commodities traded mixed with WTI (+USD 0.21/bbl) now in the green, albeit off Friday’s highs. Brent (-USD 1.01/bbl) on the other hand is lower as the global benchmark reacts to the OPEC and OPEC+ meetings at the back-end of last week. The oil producers agreed on an output hike, though no specific numbers were confirmed. The output increase is yet to be distributed amongst the members. Saudi Energy Minister Al-Falih said on Saturday that the increase is to be closer to 1mln BPD than to 600K BPD. The metal complex looks relatively mixed, gold and copper trades flat, synchronised with the uneventful dollar moves. Elsewhere, Shanghai steel rebar prices dropped for a second consecutive session following a rise in steel product inventories raising concerns about oversupply and weakening demand in the market. Looking at the day ahead, we'll have the May Chicago Fed national activity index, May new home sales, and June Dallas Fed manufacturing activity index. It was a busy weekend for markets with the informal EU meeting, Turkish elections, a Chinese RRR cut and more signs of escalating Trade tensions. Starting with China, on Sunday the PBoC said it will cut reserve requirement ratio (RRR) by 50 bps from July 5, which is just 1 day before higher US tariffs on $34bn of Chinese goods will start. The RRR cut is expected to inject RMB 700bn (US$108bn) of liquidity to the economy, with 500bn going to 12 large banks to support debt to equity swap programs and 200bn going to small banks for their lending to small businesses. DB’s Zhiwei Zhang and team believes the shift of policy stance is well expected by the market and take this as a signal of policy easing, likely in response to the weakening macro data and the threat of trade war. They believe the policy easing will likely put upward pressure on property prices and depreciation pressure on the RMB. Overall, they: i) revise their forecast of USDCNY to 6.8 and 7.2 by the end of 2018 and 2019 (vs: 6.4 and 6.4 previously), ii) see one more RRR cut in 2018 and three more in 2019 and iii) continue to expect GDP growth to slow modestly for the rest of the year (Q1: 6.8%, Q4: 6.5%) and next year (6.3%). Refer to their note for more details. Over in Turkey, Reuters cited local news agency Anadolu which reported that 99% of the ballots have been counted and the incumbent President Erdogan has declared victory after winning 52.5% of the Presidential votes (vs. 31% for his closest challenger), while his AK Party and coalition ally MHP has won a total of 53% of the votes. This morning, the Turkish Lira has firmed c0.5% against the dollar. Over now to Brussels where on Sunday, 16 EU leaders have met for emergency talks hoping to get a migration deal before the full summit later this week. In the end, there was no EU wide deal, instead members endorsed further tightening of their own borders and pledged to give more money to foreign countries to prevent people from entering into Europe. Germany’s Ms Merkel noted that “there will be bilateral and trilateral agreements (with individual EU states)” rather than waiting “for all 28 members” for some sort of EU wide agreement. Similarly France’s Macron said the solution should be “European”, but noted it could just be several states together. Now moving onto some of the latest headlines on trade. After President Trump’s threat of higher tariffs on European made cars on Friday, the EU Commission Vice President Katainen noted on Saturday that “if they decide to raise import tariffs, we’ll have no choice, but to react”, although he also added that “we don’t want to fight (over trade) via Twitter, we should end the escalation”. In the US, the WSJ reported that the US Treasury is preparing rules that would block firms with at least 25% Chinese ownership from buying US companies involved in “industrially significant technology” as well as “enhancing” export controls to keep technologies from being shipped to China. Meanwhile in China, the HK based newspaper SCMP cited two unnamed Chinese government sources who noted that China does not plan to target US firms operating in China as this “option has never been on the cards”. As a reminder, the big question on our Chinese economists mind is whether China will move beyond trade and target US business interests in China. The team estimate that US firms sold US$448bn worth of goods and services to China in 2017, with c37% through trade and c63% ($280bn) through local operations by US subsidiaries in China. With all this weekend news, markets are trading mixed in Asia with the three Chinese bourses up 0.1%-0.7% while the Nikkei (-0.47%), Kospi (-0.05%) and Hang Seng (-0.38%) are down modestly. Meanwhile the UST 10y yield is down c2bp and futures on the S&P are down c0.5% as we type. Looking ahead to the rest of the week, the meeting in Brussels yesterday is the precursor to the highly anticipated EU Summit on Thursday and Friday in the same city. There’s no doubt that the big topics of discussion amongst EU leaders will be the latest trade war developments and Brexit, as well as migration policy, the EU budget, security and reforming the economic and monetary union. If all that can be solved in 2 days I’ll be very impressed. In terms of data this week, all of it is outlined in the week ahead at the end but the highlight is probably Friday’s US PCE and Europe’s first look at June inflation across the region on Thursday and Friday. Remember that April’s data was very weak but Easter was blamed. May’s then was much stronger than expected just at the time Italy was blowing up and bond yields were collapsing. 1 month later a dovish ECB and trade tensions have created another European bond rally so the inflation number will be interesting in this light. As for markets back on Friday. European equities were all higher following stronger oil prices (more below) and better than expected PMIs. The Stoxx 600 (+1.09%), FTSE (+1.67%) and DAX (+0.54%) were all up, although the latter was weighed down by car maker stocks (BMW -1.1%; Daimler -0.3%) after President Trump tweeted “if these (EU) tariffs…are not soon broken down…we’ll be placing a 20% tariff on all of their cars coming into the US”. Over in the US, the Dow broke its 8-day losing streak and avoided the worse daily run since 1978 (+0.49%), while the S&P rose +0.19% and the Nasdaq retreated for the second straight day (-0.26%). The risk off tone was also evident with the VIX down 5.9% to 13.77. Meanwhile government bonds were broadly flat with 10y treasuries and Bunds yields only moving 0.2bp, although Gilts rose 4.2bp, partly reflecting the ongoing reactions to a more hawkish BOE. Oil prices jumped 3-4% on Friday after OPEC signalled a smaller than expected increase in oil output (Brent +3.42%; WTI +4.64%). The OPEC and non-OPEC members agreed that they would return to 100% compliance with the previously agreed oil outputs. However, over the weekend the messaging on the exact amount of increase seems a bit less clear with the Saudi Arabian Energy minister indicating that this implied a reallocation of production from members with limited spare capacity to those who have more, and pledged a “measurable” supply increase and “will do whatever is necessary to keep the market in balance”. Conversely, Iran’s minister indicated that if OPEC members stick to their own allocations, then the real output would only increase by 500k bbl per day by the end of the year. This morning, Brent and WTI are down -1.9% and -0.4% respectively. Before we take a look at this week’s calendar, we wrap up with other data releases from Friday. In the US, the June Services PMI was in line with expectation at 56.5, while a softer than expected manufacturing PMI print (54.6 vs. 56.1 expected) contributed to a lower but still solid composite PMI of 56 (-0.6pt mom). The New York Fed’s estimate of Q2 GDP growth ended the week at 2.9% saar, down a tenth from a week earlier. In Europe, the flash June PMIs improved mom and were broadly stronger than expectations, driven by services PMIs. The Euro area composite PMI rose 0.7pt mom to 54.8 (vs. 53.9 expected) while manufacturing PMI was in line at 55 and the services PMI rose to a four month high of 55 (vs. 53.8 expected). Across the countries, Germany (54.2 vs. 53.4 expected) and France’s composite PMI (55.6 vs. 54.2 expected) were both above market, mainly due to stronger than expected Services PMIs. Meanwhile, France’s 1Q GDP was confirmed at 2.2% yoy.